I’ve been thinking a bit about babies. UPDATED MAY 21, 2009: Now I know why politicians kiss them & single men will borrow them from friends to stroll around with in public parks. Everyone loves babies! This post received an unexpectedly high level of offline response. A friend from far away wrote, “I’m hoping to sit down with you over a something, soon, find out why you’re thinking about babies, their little dimply wrists, oh!” Another asked if my biological clock was ticking. (Technically that would be a no, because I don’t have one. Apparently science education in America still really lags behind.) A third person, a two time father who is related to the baby pictured above by marriage, was disappointed that I featured only a photograph and no deep thoughts. Do I even have deep thoughts about babies, though? Does anyone? The special thing about them seems to be how they inspire not deep contemplation, but instant feeling. What I wonder is if those feelings differ by gender? By whether you, yourself, are a parent? By age, income level, and experience? Et cetera. 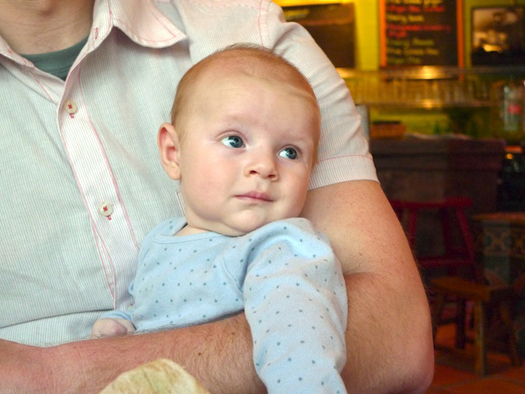 Do new parents always look at their baby one way, while a grizzled grandparent always looks to babies with a different set of associations in mind? Of course everyone has a slightly different worldview, but statistically speaking, is there a mean average view on the subject based on where you are in the river of life?